Goal of Losing: The Good, Bad, and Great. The Good, Bad, and Great. I've got a quick update for you today. I have some good, some bad and some great news to share. The Good: It is Friday! The Bad: I am extremely busy at work and will be working late. The Great: I am down 3 or 4ish pounds in two weeks, weighing in at 234.2 this morning! Only 3 pounds away from my lowest weight in 5 years! I made chicken enchiladas for dinner last night. Since I am working late, we will most likely be having the leftovers for dinner tonight. If you're interested in the recipe, you can find it listed in the "recipes" tab, above. I had two leftover tortilla shells and hate to waste food. 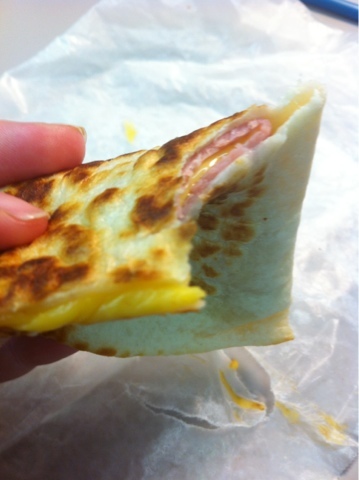 I decided to use the extra to make ham and cheese quesadillas for lunch today. It was simple, easy and great! Told you this was going to be short. Have a great Friday!